Tina Rasmussen - Harbourfront Centre, Director, Performing Arts Alex Dault - Single Thread Theatre Co.
Jonathan Langley - Single Thread Theatre Co. This panel will focus on how art takes over and transforms city streets, squares, parks and other public places. This panel will look at the impact events such as these can have on the community, and the behind the scenes logistics of mounting them. Heritage institutions preserve the past, but they have a role to play in the present. This workshop will focus on learning the strategies and tools needed to turn museums and cultural institutions into true community spaces. Online and digital projects increasingly represent a huge opportunity in this sector to achieve greater accessibility and reach new audiences. This panel will discuss the multiple ways in which cultural institutions can expand through digital initiatives. This workshop will focus on developing the skills needed to implement best practices and create mutually meaningful relationships with a variety of funding sources. This panel will look at the ways that arts, culture and heritage institutions can go beyond the traditional and think outside the box, creating fresh and vibrant new programming to reach new audiences. 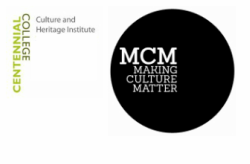 This workshop will develop ideas, tactics and strategies that cultural institutions can use to establish themselves in increasingly diverse communities. NOTE: In each session, workshops run concurrently with panel discussions. Delegates are encouraged to pre-register for workshops of interest as seats are limited. Panel discussions are open to all.